Christmas, New Year and Australia Day holidays are all over. All our friends and family have gone home and the house is quiet once again. John is back at work, and the Mia Cat and Jimmy Dog are both back into their usual routines. Hello 2018! I have now finished off some of my projects I started before Christmas and cleaned up my Art Room ready to get started for another wonderful year. I sat at my desk looking around and on the floor in the corner was my Christmas box from my husband John. I didn’t have a chance to look through it properly when I got it. I was so excited it was like Christmas all over again. As I took off the lid, I got a soft familiar smell of the art supplies, it was wonderful. All the possibilities of what I could make. He had thought of everything!! 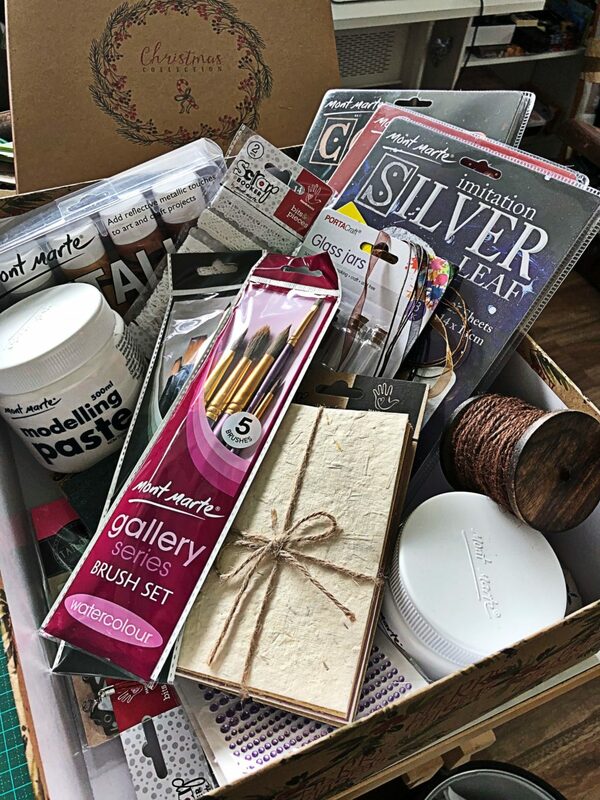 Three different types of glue sticks, paper, threads, brushes, Gesso, Modelling paste, ribbons, lace, metallic paints, gold, silver and bronze leaf and so much more. I felt like a little kid again and it’s my first day of school when the teacher would hand out all the new penicils and books. You would swear to love and take care of them and keep them new forever. Such Joy. My lovely husband has also built and refreshed my website. All I need to do now is fill it with loads of creations. So excited to get started. Hope you will follow my journey.